WHEN IT comes to professional athletes - and yes, pool players are athletes - they just seem to be a bit different from us regular folk. The way they approach their craft, the way they can do physically exactly what they see mentally, even the way they walk, there's a seamlessness to their actions that makes even the most difficult tasks look effortless. Think of Michael Jordan draining a fade-away jumper, or Ted Williams sending a ball screaming through the gap. In our sport, Mike Sigel has that kind of talent. Take the 1992 Bicycle Club Invitation in Bell Gardens, Calif., as an example. In the hot-seat match, "Captain Hook" had the break in the case game of a 12-12 set against CJ Wiley. Making a ball on the break, Sigel ran into a bit of trouble getting position on the 5, which was partially hidden by the surround 8 and 9 balls. 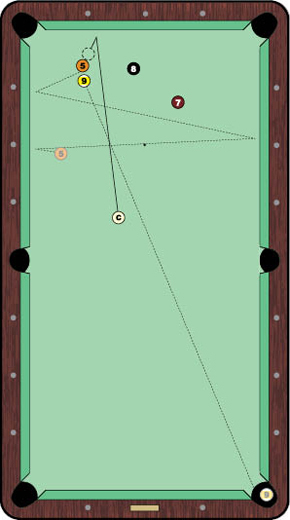 With the 3 ball deep in the lower right corner pocket, Sigel drew the cue ball off the left long rail in hopes of then sending the 5 into the top left corner. But he fell a bit short, ending up at the position shown in Diagram 1. He didn't have a clean look at the 5, so he was forced to improvise. Taking a minute to get a few good looks his predicament, Sigel loaded up on left English and spun the cue ball off the rail for a nearly full hit on the 5 ball. The 5, just a smidge to the left of the 9, then threw the match-winning ball toward the bottom right corner. As the 5 ricocheted between long rails, the 9 ball barely snuck inside the left side of the corner pocket. Wiley, the tough-luck loser in this 25th rack, then went on to lose to Kim Davenport in the third-place match. In the final, Sigel then trounced Davenport in the shortened championship set, 9-5, for the $12,000 payday.